David Braben and Ian Bell‘s seminal 80’s classic game Elite is probably my favourite game of all time. There’s been numerous versions of it on computers and consoles such as the C64, Amiga, BBC Spectrum, PC and Acorn Archimedes. There’s even some ports to OpenGL and Gameboy Advance ports of it and a recreation of it called oolite for Mac OS X, Windows and Linux. Recently a NES version of it popped up on eBay and I was lucky enough to nab it (for $42…). Definitely a nice piece to have in my small NES cart collection, as its apparently quite rare having only been released in PAL territories. 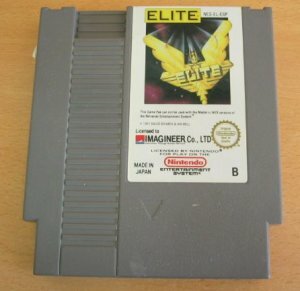 According to the UK NES Rarity list, it rates an A-; “These Will Require A Lot Of Looking“. Would have been nice if it came with a box though, although that would no doubt have jacked up the price even more. Its the Namco TV Classic 5 in 1 Games. Features Pacman, Dig Dug, Galaxian, Bosconian and Rally-X, all in this little joystick. So now you know what to buy me for my birthday 😉 And if your feeling generous, you could get me the Atari Classics 10-in-1 TV Games at the same time! Everything from MAME 0.82 and MESS 0.82. The romcmp tool now builds on Solaris. Converted the documentation from LinuxDoc to a more modern DocBook format. Looks like some nice stuff is coming out of E3 this year. Nintendo have been showing off their Nintendo DS dual-screen handheld device. And also Sony presented they’re upcoming PSP handheld device.